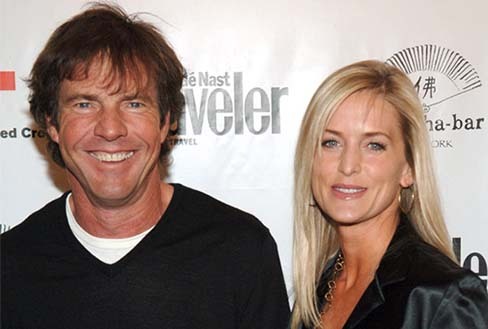 By Hollywood standards, there is no reason why Dennis Quaid should still be a movie star. His film career is venturing toward the 25-year mark—well past the expiration date of most of his peers who are no longer bankable. Yet Quaid is in the middle of a remarkable career renaissance. In 2003 alone, he won the New York Film Critics Award as Best Supporting Actor and receiving Golden Globe and Screen Actors Guild award nominations for his stellar performance in the critically praised [Far from Heaven], costarring Julianne Moore. He’s back in a big way in the role of Sam Houston in what may be the most integral part of The Alamo. When Quaid arrives to tee up, he’s coming from a grueling 14-hour day on the film’s set. Speaking Cherokee. Quaid is a latecomer to the project; costars Billy Bob Thornton (playing king of the wild frontier, Davy Crockett) and Jason Patric (playing sand-in-the-line-draw-er William Barrett Travis) have already been in Austin filming for months. Directed by fellow Texan John Lee Hancock, the project is budgeted at $75 million and promises to be a faithful retelling of Texas’ notorious battle against Mexico. “Hancock is fantastic,” says Quaid. “The Rookie was a $30 million film. He did such a great job on that as a directorial debut. Now he’s taken on this, which is such a huge thing. Everybody’s going to be really surprised about The Alamo.” Not since the original The Alamo starring John Wayne was released in the ’60s has a movie about this state history been so widely anticipated. It arrives in theaters nationwide in December, and there’s a strong chance that the film’s premiere will take place in Austin. He’s taller than one expects him to be. Standing at 6’1” and in great shape, thanks to a commitment to yoga and weight training, he’s grown mutton chop sideburns to go with his 1836 persona of Sam Houston. When the original The Alamo debuted, Quaid was attending Paul Horn Elementary School in Houston. “I used to play The Alamo—the Battle of San Jacinto—as a kid in Houston, so this makes the movie cool for me. We had Texas history in school before we had American history, and I knew quite a bit about it before the film.” He never could have imagined that more than 40 years later he would be acting as the man integral to the battle and his hometown’s namesake, Sam Houston. Quaid’s star power began its megawatt rise with the surprise hit of 1979, Breaking Away. From there, he captivated the world by playing what can now be considered classic roles: astronaut Gordon Cooper in The Right Stuff, a film noir-style police detective in The Big Easy, and pilot Tuck Pendleton in the sci-fi fantasy Innerspace. After a string of mostly forgettable films in the early and mid-’90s, he bounced back with The Parent Trap, The Rookie, and the hit, Traffic. Shy and reticent around most people, "I was very uncomfortable with all the attention when it first started happening to me,” he said early in his career. “I retreated quite a bit from the world, both physically and emotionally. 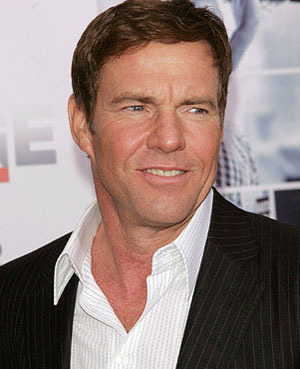 But then you just accept that you can't control what the rest of the world thinks or does.” Now moviegoers’ desire to see Dennis Quaid on the big screen has led him to one of the biggest comebacks in film history. Todd Haynes, the director of Far From Heaven, has said about Quaid’s critically praised role as a McCarthy-era repressed homosexual husband: “There aren't many men who are man enough to do that.” These days Quaid seems to be able to do anything. When I ask if there is another role in the film he would have wanted to play, he responds, “When you hear of the Alamo, you think of Davy Crockett. But Billy Bob really [is] Davy Crockett. He’s a hillbilly movie star, and that’s what Davy Crockett was at the time,” referring to the hero’s legendary persona. Based in Los Angeles and Montana, Quaid enjoys working in Austin: “Texas has a really great film commission—and Austin is really the best place to shoot. There is such diverse land around the city. You go east, and you get the forests. Go west and get all the hills. It’s better than just about anywhere.” Of course, it doesn’t hurt that this is such a great music town. The Sharks’ style is more Americana rock. “When I am working, we play every few weeks. When I am not working in L.A., we try to play every week there. Here, we like to play at Antone’s; we always have a good time. We just played with Los Lobos at Stubbs. We also were at Gruene Hall near New Braunfels, where we shot Flesh and Bone.” Quaid’s greatest musical inspirations are classic artists from years past: “When I was growing up the Beatles were big,” says Dennis. “I also like Elvis and Hank Williams.” Quaid has written songs for three of his films: The Night the Lights Went Out in Georgia (1981), Tough Enough (1983), and The Big Easy (1987). While he’s in Austin, he enjoys some of the area’s best restaurants. “I like Trulucks, Sullivan’s, Kenichi, and anyplace that serves barbecue. I also like Fran’s Hamburgers—I just had one this morning for breakfast,” he says. And when he’s not working, playing music, or eating, there’s golf. So what’s next? His Hollywood stock is trading well, not only with his work on The Alamo, but also his upcoming big budget films Day After Tomorrow and The Devil's Throat, to be released next year. “I’d like to direct again some day, but it takes eighteen months out of your life to do that,” says Quaid, referring toEverything Rises, the 1998 TNT made-for-TV movie he directed and starred in. No matter what his next choice of film or directorial roles, count on Quaid’s inevitable return to Austin to film another project sometime in the future.